Lots of people use Facebook to check out local businesses, see how many of their friends have been there, and view ratings and recommendations. If you ever check out a place that's particularly awesome or come across one that you wouldn't recommend someone ever visit, you can easily leave feedback on Facebook letting other potential visitors and customers know about your good, or bad, experiences. 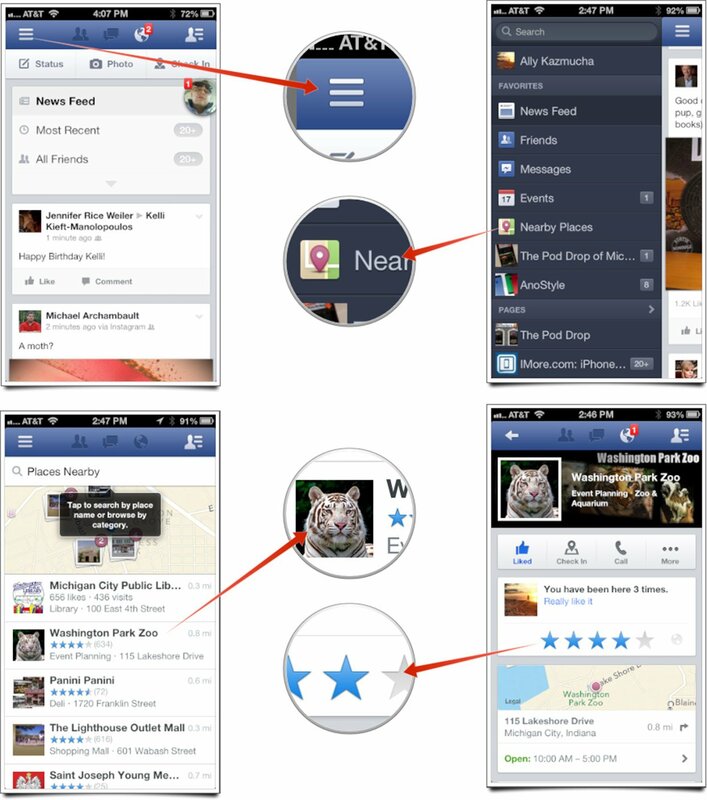 Tap on the menu icon in the upper left hand corner of the screen to bring up the navigation menu. Now tap on Nearby Places. (As a side note, you can always search for any place you'd like from the search bar as well, but you won't be able to rate a place unless you've checked in there at least once). Tap on the name of the place you'd like to leave a rating or recommendation for. At the very top you'll be able to see a star rating. Just tap on the amount of stars you'd like to award the particular location. Note that you won't see an option to leave a star rating if you have never checked in to prevent false ratings. If you scroll a little further down on a business page, you'll also see an option for Recommend This Place. Tap on it. You can now write a short review or recommendation and then tap Post. That's all there is to it. Your friends will instantly see your recommendations when they visit that location's page. If your privacy settings are set to allow it, the public will also see ratings and reviews you leave on businesses and attractions. Do you and your friends use Facebook for ratings and reviews or do you use something else like Foursquare? Even though I use both, I've found that most of my friends tend to gravitate towards reviews and ratings for Facebook more than anything.